For NGC Oversize Holders that are 18mm thick (box holds 12 holders). Holds 20 NGC Slabs in a sturdy red colored box with the NGC logo in raised gold print. Holds 20 PCGS Slabs in a heavy-duty blue plastic box. Made in the USA, these boxes feature the PCGS logo and are custom made for PCGS certified coins. 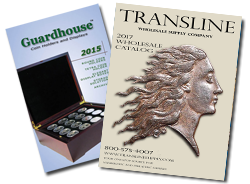 Holds 20 NGC Slabs in a sturdy metallic colored box with the NGC logo in raised blue print. Holds 14 Double Thick NGC slabs in a sturdy metallic colored box with the NGC logo in raised blue print. Unique sliding 2x2x9" drawer box with inside base that slides in and out. Easy to stack and made of hard plastic. Attractive storage for 2x2 coin holders. Organizes coins in a professional looking and funtional storage box. Made of plastics, with three dividers, and measures nine inches long. Perfect for storing 2X2 coin holders. Holds 39 2X2 Plastic Holders.